Dr Jeroen Aeles has completed his PhD in Biomechanics at KU Leuven, Belgium in 2017. 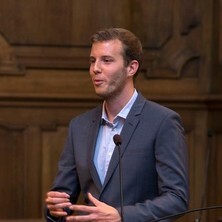 His work focussed on muscle-tendon interactions during sports movements, using ultrasonography and musculoskeletal modelling techniques. He joined the Centre for Sensorimotor Performance in the School of Human Movement and Nutrition Sciences at The University of Queensland as a postdoctoral research fellow in 2018. His current work combines neurophysiological and biomechanical methods to quantify single motor unit behaviour during voluntary muscle contractions. His general interest is in understanding the fundamental mechanisms that drive muscle performance and how these mechanisms are affected by muscle geometry, their local environment, and neural control.